An A4 white card sheet filled with gold, die cut Christmas greetingsand sentiments. 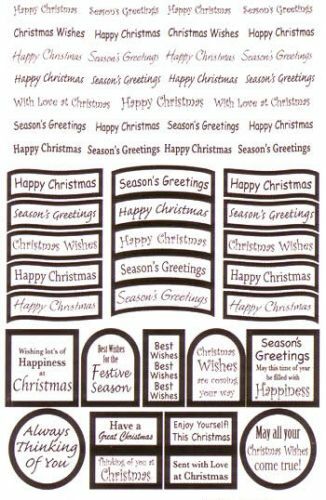 The sentiments come in wavy edged strips that can be used as a border or cut into individual greetings, curved and arched individual greetings and small tags in a variety of shapes, all with a variety of Christmas wishes and phrases. Simply pop them out of the sheet and adhere them to cards and gifts. Also available in White/Silver.